Hello Explorers! 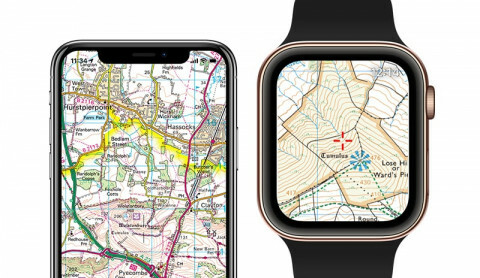 Last week we pushed out a ViewRanger update to support the new iPhones and Apple Watches. The big news is we now support all the bigger screen sizes. And that means more ViewRanger maps on every screen. We now fully support the iPhone Xs, iPhone Xs Max, and iPhone XR models. Our maps look great on these phones, especially the scale and perspective you can get on the 6.5-inch display of the iPhone Xs Max. This larger screen is helpful when you need to understand the terrain around you, and what’s ahead. It sure beats the super-tiny monochrome screens we used to design for on Nokia phones. Anyone remember those? The new Watch Series 4 models not only have bigger screens, but bigger display areas within the screens. The edges of the new screens are now rounded instead of square too. That allows us to squeeze a bit more map details on every watch screen so you have more information with every glance. This update also squashes bugs we found with iOS 12. But if you see any bugs, please report them to our support team at support@viewranger.com. To get these updates, download the latest version of the ViewRanger app from the App Store. Happy exploring!